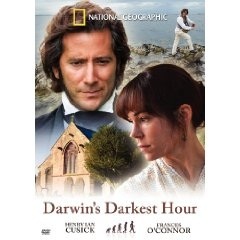 Even if the Charles Darwin bio-pic Creation, now in UK theaters, can’t find a distributor, PBS will be airing it’s own ode to Darwin on Oct 6, entitled Darwin’s Darkest Hour. This film looks interesting b/c it explores how his theory affected his faith and that of his believing wife. Interestingly, this actor playing Darwin recently also played Jesus in The Gospel of John (2003). Funny that he got to play the leaders of two powerful, opposing religions world views! I really love these pics because they really bring up the whole issue of evolution, which ought to be examined in the light of true skepticism. I think evolutionary theory is not only erroneous, but is probably one of the most mistaken and deleterious theories ever to grace the world (up there with Islam), having influenced Hitler and American eugenics, and having adulterated good science, not to mention needlessly undermining people’s confidence in the Bible.